He had recently spoken out (under a pen name) about his former colleagues who were languishing incommunicado in detention centers in Eritrea, a story that was then covered by various media including The Guardian, in partnership with our organization. Before I could congratulate him on this, he began discussing safe ways to send the article. He said he wanted to write the article anonymously. He lives in the United States under a grant of political asylum. I gave him both my email address and an official email address for article submission. “But email is not safe,” he replied. “Eritrean security can crack it.” He explained that he wanted to avoid imperiling family members back home. I countered that it was unlikely that Eritrean security would bother to hack the email accounts of two relatively unimportant Eritreans living in the US. This is an unfounded fear that exaggerates the reach of Eritrean security, I said. I explained that PEN Eritrea is trying to fight such inherent fear and discourages authors from writing anonymously or under pen names unless the person is at great risk, say from inside the country. It is our policy to request that all contributors to take full responsibility for what they write. We also require contributors’ email addresses to be included for publication. My colleague is not alone. His is a pervasive fear that has been inculcated among many Eritreans. They have experienced one of the world’s most repressive dictatorships, a place where the populace is subject to mass surveillance. Once they flee the country, it can take years for expatriate Eritreans to fully comprehend what was happening to them. Many live under extreme paranoia, suspecting conspiracies around every corner. 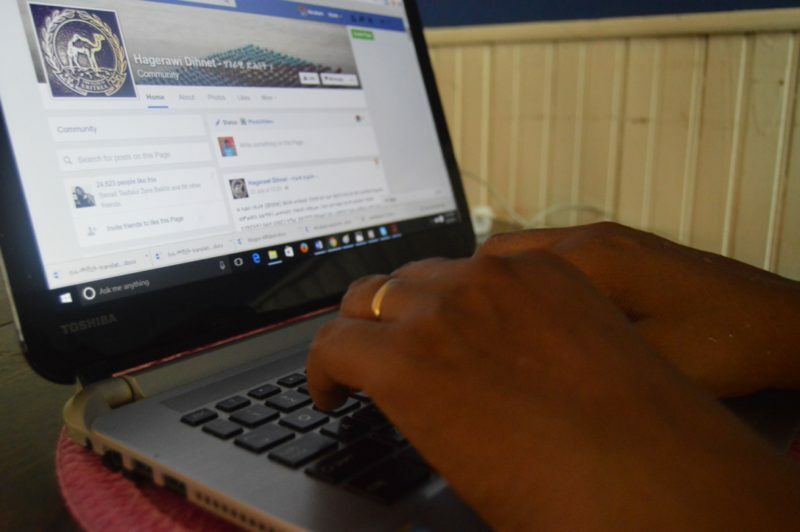 I frequently encounter Eritreans living safely in the West, with political asylum, who feel they can’t even “like” social-media posts that are critical of the regime back home. Instead they prefer privately writing or calling the individual whose post they wanted to react to. They fear the regime is tapping everyone’s social media account. And their fears aren’t entirely unfounded. It is public knowledge that the prime job of Eritrean consular offices and their surrogates throughout the diaspora has been reduced to watching who’s associating with whom, in order to report when somebody with “incorrect” associations returns to Eritrea. This practice has imperiled many Eritreans when they went home to visit family members. As Tricia Redeker Hepner discusses in her book “Soldiers, Martyrs, Traitors, and Exiles: Political Conflict in Eritrea and the Diaspora” (2009) the trend also extends to audio recording by their compatriots via hidden devices to report to the state security back home. This innate fear has been cultivated by the ruling elites’ longstanding tradition of ignoring the rule of law and behaving irrationally and unpredictably. At any point, a torturer might turn into the victim. The steady flow of arbitrary arrests and intimidation of journalists, in particular, and the populace in general, has resulted in a total disregard for rule of law. Such incidents, as common as they are, erode the confidence of the people to the point where they can’t trust any government institution. This tradition has also fostered an inherent culture of fear and mistrust among citizens. This culture of paranoia has created the impression, among many, that the Asmara regime has the power to spy on every Eritrean in any corner of the world. The regime has successfully portrayed itself as omnipresent—which is fundamental to its survival. 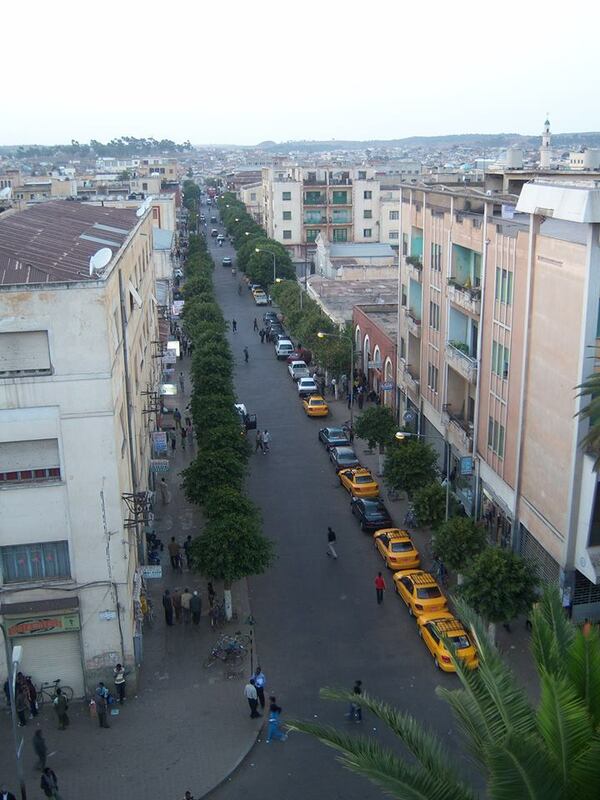 Asmara, Eritrea's capital city. Photo by Yonatan Tewelde, used with permission. These dynamics are compounded by a lack of credible information coming out of the country, which has also played a major role in cultivating mistrust and fear. Alongside the regime’s long tradition of severely punishing state and independent journalists—the last accredited international correspondent was expelled in 2007— there is no independent source to confirm the veracity of any information. When seven of the country’s private newspapers were banned in 2001 amid a political crackdown, 12 journalists were taken into custody. This swift action was followed by the raid and ban of the educational Radio Bana in February 2009, and the jailing of about 50 journalists and staff members. These assaults on both state and independent media have crippled free flow and exchange of information. News sources today are limited to the state media’s monotonous propaganda organs, which make nationals wary of any information coming through the official line. The Eritrean state media, which was mostly institutionalized under the longest-serving propaganda minister, Ali Abdu (who later fled the country), is characterized by a lack of accountability and a habit of character assassination. The Ministry has absolute power to put down anyone they perceive as having even slight differences of opinion, or for really any reason at all. Many Eritrean citizens became victims of character assassination in the national media under Abdu and his “hit team.” Public figures such as artists, political leaders and athletes were typical prime targets. Naturally, these attacks were published under pen names, although it was not difficult to know who was the mastermind behind the curtain. Anonymity abounds. But what about accountability? This tradition of character assassination and using pen names to attack anyone who expresses a contrary or different opinion has been adopted by Eritrean social and mass media in the diaspora, both pro- and anti-regime. Fake accounts and pen names are common, making it nearly impossible to tell who is who. Not surprisingly, pro-regime attacks have the effect of silencing many critics who fear the consequences of speaking against their country’s government. Dissident voices are mercilessly countered by anonymous users. This normally involves intimidation and in some cases extends even to death threats. The opposition camp is not immune from such practices either. Many regime opponents employ similarly abusive language and fabricate information to destroy people on the other side. The tradition of anonymity and character assassination is manifested in independent websites as well. It’s common among Eritrean independent media to use pen names todestroy someone in the opposite camp. Or else—in the name of freedom of expression—individuals will combine abusive language with an absence of facts and often get away with it. In this extremely polarized political environment, most topics are reduced to simplistic, back-and-forth arguments between “opposition” and “pro-regime.” And predictably, many websites on both sides continue to publish anonymous articles to avoid accountability. These practices erode credibility and cultivate a tradition where it is nearly becoming impossible to discern reality from made-up facts. In the end, these interdependent practices only serve to damage collective intellects, leaving institutions in tatters and prolonging the life of the dictatorship.